In the days of old rosemary was used for anointing and blessing. It was thought to bring love and peace and to provide protection and purification. Once used as a memory aid, students used to carry a sprig of rosemary with them to examination rooms, it became the emblem of fidelity and remembrance. Brides wore it to indicate that they should always remember their roots and their relatives. Worn as a garland it signified that she carried to the new home loving memories of the old. The dead were buried with it to signify that they would not be forgotten by the living. Increase memory, concentration and focus - Rosemary affects the central nervous system from its potent antioxidant, rosmarinic acid. it enlivens the mind and helps with faster memory recall. Provide pain relief and promote blood circulation - Essential oils infused with Rosemary are used in massage oils to relieve arthritis pain and tone the circulatory system. It's also used to ease sore aching muscles and can be used as a chest rub to ease congestion. Give hair a beautiful shine - Rosemary extracts in shampoos or hair tonics help to with dandruff, restore flyaway hair and make it shine. Apply a few drops of Rosemary essential oil to your scalp or hair brush for immediate benefits. It is particularly good for those with dark hair. Freshen the breath - John Gerard, in his ancient herbal, mentions that Rosemary is useful in keeping the breath sweet and clean. He advises drinking the distilled water of the flowers early in the morning and last thing at night. Culpeper suggests eating the flowers every morning, while fasting, with bread and salt: "It helps dim eyes, and procures a clear sight." Relieve symptoms of depression and sluggishness - Just one whiff of this aromatic herb can lighten your mood and provide a sense of overall well being. Reduce fevers - Taking a bath in Rosemary infused water (either a small branch or a few drops of essential oil) can aid in reducing fevers in adults and children. Add a few drops of lavender or bergamot to make it work even better. Improve digestion and digestive tract health - Rosemary helps relax muscle spasms in the digestive tract which aid digestion and improves over digestive health. It also can help cure disorders such as constipation and diarrhea. Rosemary is a good source of vitamin A (beta-carotene), vitamin B6, vitamin C and folate. It's also a good source of minerals including calcium, iron, magnesium, manganese, and potassium. Vitamin A is essential for the formation and maintenance of healthy teeth, skeletal and soft tissue, mucous membranes, and skin. It is also very important for eye health. Beta-carotene is an antioxidant that protects against free radical damage which are believed to play a role in certain diseases and the degenerative aging process. 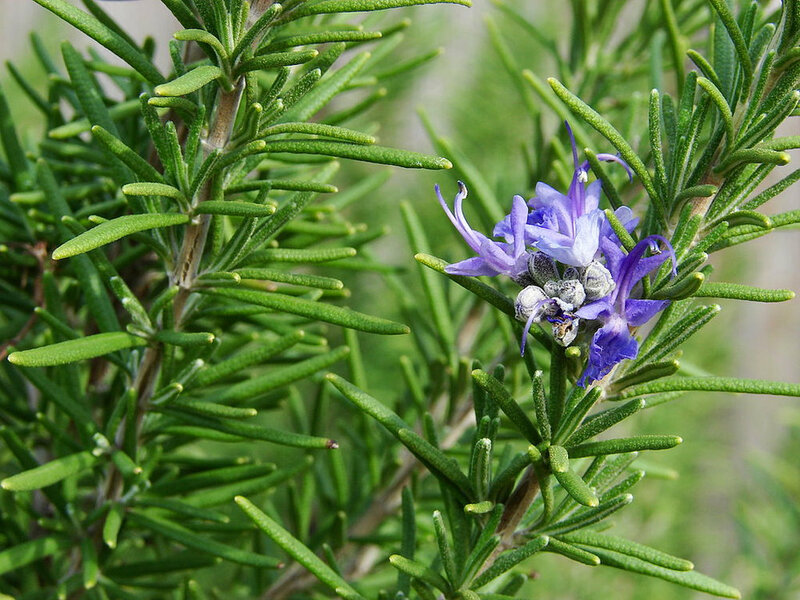 Rosemary contains 68.80 IU of vitamin A in each serving, or 1.38% of the recommended daily value. Vitamin B6 is a water soluble vitamin also known as pyridoxine. It is primarily used in protein metabolism and to make hemoglobin, a protein in red blood cells that helps carry oxygen to the body tissues. Rosemary provides 0.04 milligrams of the 1.3 milligrams needed for healthy adults.